"Star Trek meets Cheech & Chong!" – #1 INTERGALACTIC BESTSELLING author Tom Sadira invites you to take a trip to the farthest reaches of outer space in this hilarious sci-fi adventure saga. Charlie Hong is on the run from both sides of the law. He’s spent the last year in hiding, cultivating one last hair-brained scheme to escape his troubles: a clandestine marijuana operation. Just as he’s about to cash in, his cash crop is stolen by a bright light appearing in the night sky. After catching a ride with one of his plants, he finds himself thrown into a world far stranger than anything he could have possibly imagined. 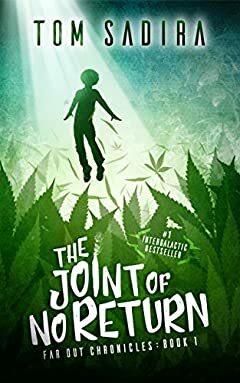 Does the stoned stowaway have what it takes to free the Starseed, a massive living spaceship overflowing with bizarre life forms, from the clutches of a mysterious force field trapping it in Earth’s orbit? More importantly, before he decides anything, does he have time to light one up? Readers have compared the The Far Out Chronicles series to Douglas Adams ' Hitchhiker’s Guide to the Galaxy, Barry J. Hutchison's Space Team series, Robert Heinlein, Ernest Cline, John Scalzi, and James S.A.Corey.